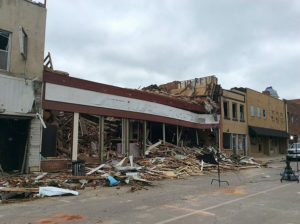 National Weather Service photo of tornado damage in Marshalltown. A nonprofit group that rehabilitates homes plans to repair 100 houses that were devastated in the Marshalltown tornado last summer. The city estimates the tornado damaged or destroyed close to 330 homes. A federal program helped them make temporary emergency repairs. Michelle Spohnheimer, with the city of Marshalltown, says from what she’s heard from other cities, it could take five years to recover. “It’s not an overnight effort and we fully expect that, especially due to the scale that we were looking at of damage,” Spohnheimer says. “We’ve seen a lot of housing repairs. We have a lot of wonderful organizations and agencies already operating in the community.” Spohnheimer says Habitat for Humanity’s effort will play a huge role in helping the community rebuild. Habitat plans to make repairs on up to 40 homes during the latter part of April and repair 100 houses by the end of the year. The blitz build is planned for April 23rd through 27th.